Historian Ross Kelbaugh has documented the Stanton & Butler partnership as a brief one: 1867 to 1871. Kelbaugh’s Directory of Maryland Photographers 1839-1900 locates their studio first at 79 W. Fayette Street and then at 14 N. Charles Street. So far I have only found one cabinet card photograph by the duo. This albumen card photograph is a “carte imperial,” another and perhaps earlier name for a cabinet card. 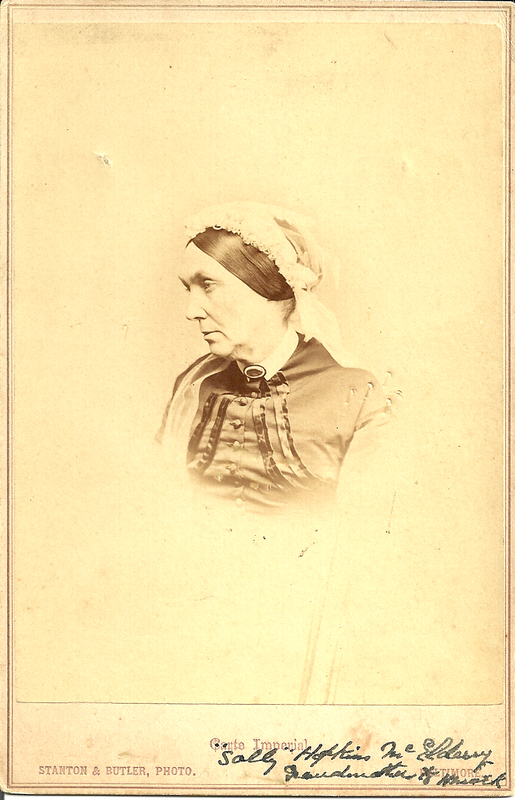 Their sensitive portrait of a weary elderly woman is identified as Sally (Sarah) Hopkins McElderry. If my research is correct, Sally Hopkins McElderry was born about 1809 in Maryland and died about 1897. She married Henry McElderry (1809-1877), a well-to-do Baltimore coal merchant, and bore him eight children.